You are listening to the singing calls of the very rare black crested Gibbon from Northwest Laos. Welcome to Far East Adventure Travel The Podcast brought to you by Far East Adventure Travel Magazine-Remote Northern Laos Close Encounters With The Ahka now on the iTunes newsstand. Visit the App Store search Far East Adventure Travel download the app and subscribe today. Hi this is John Saboe the publisher of Far East Adventure Travel Magazine and I recently traveled through one of my favourite new countries in South East Asia-Laos. I was there to explore mainly the north-which seems to be the center of adventure activities in Laos. One of the highlights was visiting The Gibbon Experience, an adventure company that takes groups into the Bokeo Reserve where they have zip lines and tree houses for viewing and listening to Gibbons. It’s about a 3 hour drive from Houay Xay in Northwest Laos right on the border with Thailand. I traveled from Luang Prabang which is close to the center of the country to Houay Xay, where you depart for the Gibbon Experience. It was a 13 hour bus ride. The other way to get there from Luang Prabang is by slowboat, a two day ride. Houay Xay is a border town with the Great Mekong river dividing Laos and Thailand. A little effort to get there but I really was driven to see and hear this rare ape species that looks more like a monkey. For some reason it doesn’t seem to get the same attention as chimpanzees, orang-utans or gorillas even though they are just as threatened. The Gibbon Experience is one of the most unique adventure activities I’ve ever done. Before I go any further I will tell you that all of my trips are self-funded. I do not solicit free trips or stays. I pay my own way. I do this so I can give you an honest unbiased opinion of these adventures and destinations. How can I give a truly honest opinion if I’ve been given a free ride?I also travel discreetly. You start out with an introduction to the adventure at the office in Houay Xay before three hour drive to the Bokeo Reserve where you are eventually dropped off in the jungle. Then it’s a trek for an hour or so before you start zip lining through to the treehouse which will be your home for the next three days. This is where you will have the best chance of hearing Gibbons, the rare ape species that’s habitat has been threatened due to agricultural expansion. Gibbons are still threatened by poachers as well. Some of the guides that work for the Gibbons experience use to be poachers and hunters. They actually enjoy a better living now working in conservation then they ever did hunting. A portion of the cost of your trip goes towards conservation and protection of the Gibbons and especially the extremely rare Sulphur-Crested sub species in The Bokeo Reserve. I absolutely loved the 2 nights and 3 days I spent there. 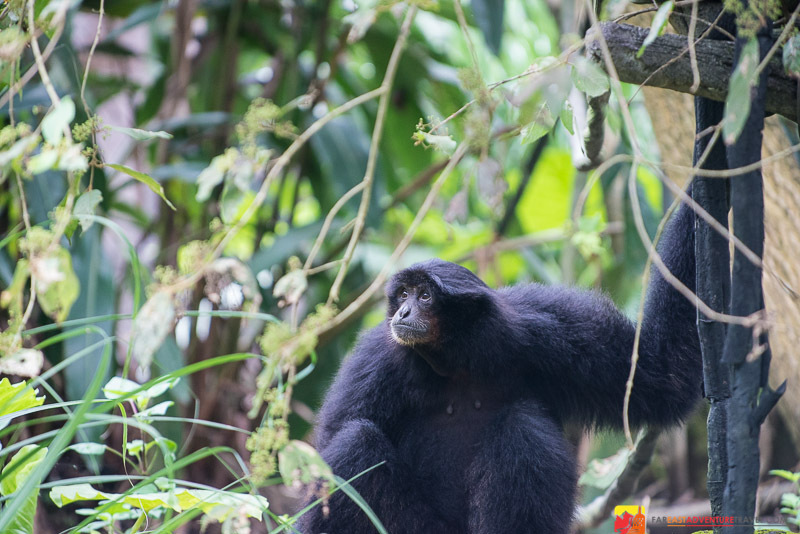 The people that run The Gibbon Experience have kept the activities pure in that it really is all about being in the jungle close to nature, with a chance at seeing and hearing Gibbons. The zip lining is a lot of fun but in no way is it presented as an amusement ride. It merely is an efficient way to travel through the jungle. The treehouse, blends into the environment allowing for 360 degree views over a lot of the jungle canopy. I’d actually never been on a zip line before. It is a very safe activity but there is a certain amount of trust you have to give over right away along with some nerves. The first line was absolutely exhilarating. It was 300 meters-not the longest line but traveling at a fast speed over the jungle canopy was overwhelming to the senses. I didn’t realize until after the second day that you are seeing so much as you travel on the many zip lines. On the second day in between treks through the jungle we travelled on about 10 different lines including the longest one at 500 meters.So much scenery and way too much for my brain to process all at once. Of course why I came was to listen to the calls of The Gibbons. I was staying in a treehouse that was about 100 meters from the ground with 6 other people. I was usually the first one to wake up. You sleep on soft mattresses that are laid on the floor with netting all around you to keep the bugs out. I would have my recorder ready. Then usually just after 6am it would start……Gibbons track…. The jungle was covered in a mist and the clouds from the rain we received overnight were still looming over the canopy so we were unable to see the Gibbons. Just hearing them was so incredible. I felt lucky and privileged. Later in the morning the clouds lifted and we saw 2 of them, 300 meters away. The second day we heard them again, that afternoon another sighting of a male, female and baby. To be in their world with them for even just a short time was an extreme privilege-one I will never forget. Go to breezy-size.flywheelsites.com to see a video of a zip line I rode in the Gibbon Experience. There is also a link for more information on the Gibbon Experience. I will have more on the Gibbon Experience in Northwestern Laos in future podcasts and as a feature in an upcoming issue of Far East Adventure Travel Magazine. That’s it for this weeks edition of Far East Adventure Travel The Podcast brought to you by Far East Adventure Travel Magazine on the iTunes newsstand. Go to the App Store – search Far East Adventure Travel-download the app and subscribe today. Or go to breezy-size.flywheelsites.com, click on the magazine icon and subscribe. This is John Saboe, safe travels and Namaste!